Citation Information: JCI Insight. 2018;3(21):e122961. https://doi.org/10.1172/jci.insight.122961. Cancer incidence increases with age, but paradoxically, cancers have been found to grow more quickly in young mice compared with aged ones. The cause of differential tumor growth has been debated and, over time, attributed to faster tumor cell proliferation, decreased tumor cell apoptosis, and/or increased angiogenesis in young animals. Despite major advances in our understanding of tumor immunity over the past 2 decades, little attention has been paid to comparing immune cell populations in young and aged mice. Using mouse colon adenocarcinoma model MC38 implanted in young and mature mice, we show that age substantially influences the number of tumor-infiltrating cytotoxic CD8+ T cells, which control cancer progression. 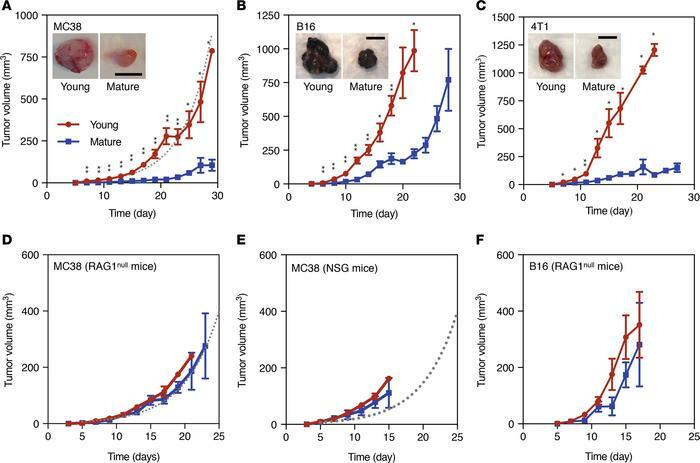 The different tumor growth pace in young and mature mice was abrogated in RAG1null mice, which lack mature T and B lymphocytes, and upon selective depletion of endogenous CD8+ cells. Transcriptome analysis further indicated that young mice have decreased levels of the Itga4 gene (CD49d, VLA-4) in tumor-infiltrating lymphocytes when compared with mature mice. Hypothesizing that VLA-4 can have a tumor-protective effect, we depleted the protein, which resulted in accelerated tumor growth in mature mice. These observations may explain the paradoxical growth rates observed in murine cancers, point to the central role of VLA-4 in controlling tumor growth, and open new venues to therapeutic manipulation. Faster growth rates of murine tumors in young immunocompetent mice are abrogated in RAG1null and NSG mice. (A) Average growth curves of s.c. MC38 tumors in young (red circle) and mature (blue square) C57BL/6 mice shows accelerated tumor growth in young mice. Dotted line represents the exponential model fit to the tumor size data points from young mice (young mice, n = 16; mature mice, n = 12). Representative images of MC38 tumors from young and mature hosts at day 30 of tumor growth are shown. (B) S.c. B16 tumor growth in young and mature C57BL/6 mice (young, n = 7; aged, n = 9). Representative images of B16 tumors from young and mature hosts at day 27 of tumor growth are shown. (C) S.c. 4T1 tumor growth in young and mature Balb/C mice (n = 6 per group). Representative images of 4T1 tumors from young and mature hosts at day 27 of tumor growth are shown. (D and E) Average growth of MC38 tumor in young (red circle) and mature (blue square) RAG1null mice (n = 6 each group) (D) and NOD-scid IL2Rgnull (NSG) mice (n = 5 each group) (E) shows no age-dependent difference in tumor growth (n = 6 each group). (F) B16 tumor growth in young and aged RAG1null mice (n = 5 each group) also showed no age-dependent difference in tumor growth. All data are plotted as means ± SEM. P values were calculated using the Mann-Whitney U test (*P < 0.05, **P < 0.005). Scale bars: 1 cm.